﻿A skateboarder sees the world in a different manner. The nature of sidewalk surfaces and skateable structures in the urban landscape are a foreign city's highlights. A trip to Paris without seeing the Eiffel Tower? 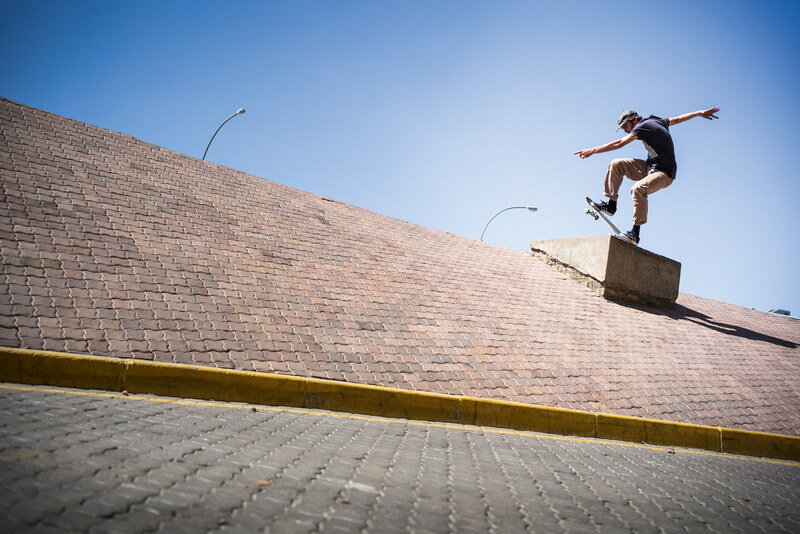 Nothing unusual for a skater like Philipp Schuster who will also find treasures in the dark suburban streets. The map is full of 'skater sights' which lead into areas one would never see as a regular tourist. That makes traveling with skate buddies very exciting. At the same time shooting in dodgy areas can be dangerous: carrying expensive photo equipment is reason enough for an armed robbery – a special experience no doubt, but something most of us would want to avoid by any means. I remember a trip to Costa Rica more than a decade ago when I went with a pack of skaters on a mission to produce an article for the German magazine Place. A local guide told us about an empty swimming pool that would be a perfect location to shoot some skate action. He also warned us that it was located in a pretty sketchy district of San José. We where all chasing after unique skate tricks, so we of course decided to go. It was a beautiful day, to me the area seemed to be just as safe as all the rest of the city, and the swimming pool was truly amazing. Our media-duo set up cameras, tripods and flashes right away and the rest of us started to shred. The local skaters who joined us that day where standing aside as if they where permanently looking out for something. As a matter of fact it only took a few moments until some guys showed up and started subtly surrounding the spot. The guide told us to pack our stuff and leave because the situation was getting unpredictable. However the newcomers started to chat with some of our group, shared some cigarettes and made a friendly impression – some of us didn't consider it worthwhile following his advice. The guide insisted on leaving immediately and almost got angry when forcing us to take off. He pointed towards a guy who was phoning and said, "That dude is calling the guys with the guns, we need to leave NOW!“ At that moment the homeboys started getting less friendly and wanted to hold us back from our car. Things happened quickly then. We made it into the van and right after leaving we could see a new gang rushing towards the swimming pool looking after us. "Lock the doors, shut the windows and don’t stop at any red light crossings“ our guide demanded.It was a key experience for me and I started thinking about ways to avoid troubles when shooting in the streets. I prefer moving in a very small group of only two or three skaters – that way we can quickly change from one place to another, like shadows in the backstreets. Traveling light is important. I carry an old backpack with a handful of primes stuck into socks, wrap a camera body in an old t-shirt and I’m good to go. No tripods, no flashes, nothing dispensable. In extreme cases one could even take a plastic bag from the grocery store and camouflage the equipment as the day's shopping. I leave any straps that scream the cameras brand name at home and replace them with shoe laces. The gear itself gets a costume as well. I cover my camera with duct tape and all parts that might show that it’s expensive gear. After some time the tape wears off and gives the body a rugged look, as if just bought at a flea market.